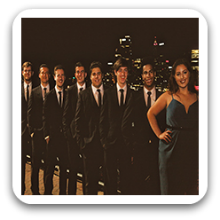 Sydney Band 511 - Hire an 8 Piece Band in Sydney For Your Next Event. Sydney Band 511 are the band for any gathering, playing hits from the 1950’s right through to the Top 40 including Jazz, Motown, Disco, Rock, Pop and Contemporary Music. We are an 8 piece ensemble comprising of drums, bass, guitar, keyboard, saxophone, trumpet and a male and female vocalist. We’re a youthful, vibrant band who’ll bring the right atmosphere to any occasion, making any event a night to remember. Can perform as a: 8 Piece Band and are available to perform in Sydney and Surrounding Areas.